GameStop Ending Wrath of the Lich King CE Pre-orders Tonight? 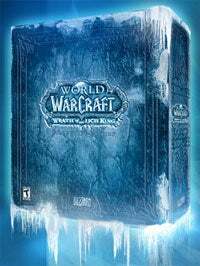 The World of Warcraft expansion Wrath of the Lich King may very well achieve something that many games before it have attempted to do but failed. The forthcoming collector's edition of the WoW expansion may actually be a collector's item. While we're not holding our breath, it would appear that retailer GameStop (and EBgames) may have already reached its allocation for Wrath of the Lich King and will be ending pre-orders at the close of business today. The CE is listed as "Currently Not Available Online," a change from its status yesterday. "Due to the number of reserves taken thus far, we are quickly approaching our allocation and may not be able to fulfill all reserves taken through close of business on Wednesday, 9/17," reads an internal communication to employees. "While we hope this is not the case, we will not know for sure until Thursday, 9/18." That last bit is, quite possibly, good news for the folks who have yet to put down a reserve on the $70 version of the game. Should you have a vested interest in calling yourself a collector, we'd advise getting your pre-order in sooner rather than later.